hello beebs: total girl crush!!! ladies, do you ever get a girl crush on someone? like... a woman who is so beautiful, classy, elegant and smart that you just can't stop staring?? haha just kidding. that sounds really creepy. but i do mean the part about being impressed with a woman with elegance and class. last night, i was the photographer at a huge fundraising event in chinatown. i will leave out the details, except that there were lots of politicians, community leaders, VIPs, socialites and other socially well-connected people there. 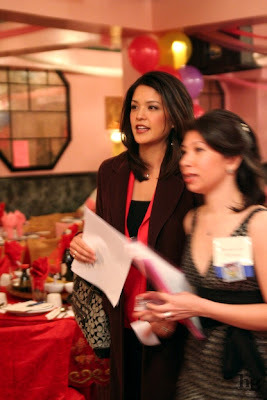 denise nakano, the NBC10 news anchor was the MC for the night. i met her in the beginning and we struck up a conversation. i was wary at first because i wasn't sure if someone like her who is a local celebrity, would even speak to me, especially with all of the politicians/important people everywhere. but she did, and she was so incredibly nice. she took time to get to know me and even joked around with me, in between talking to State Rep. Dwight Evans and the Honorable Judge Ida Chan. if you guys ever see her on TV or around town -- don't be afraid to approach her. she is great. ok i'll stop my praising now, and leave you with a picture from last night.